Striking Birds of Paradise with structured tropical foliage for a sophisticated cocktail party. A simple cube design of roses in vibrant Autumn colours. A textured display of Tom Pearce, roses, leucadendron and mango calla lilies. Roses and gloriosa lilies in a fishbowl vase with red coloured water. An Autumnal "tree" of Grand Prix roses and cymbidium orchids created for a drinks reception. 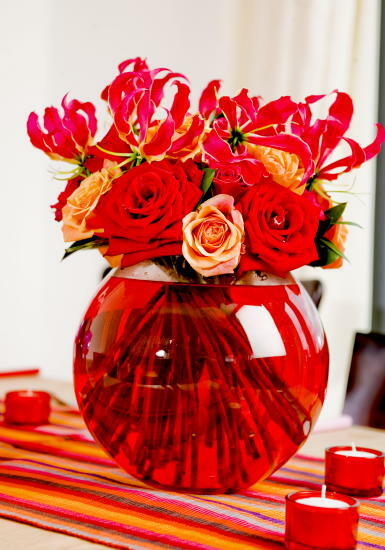 Chilli vase of Grand Prix roses, cymbidium orchids, poppy head and hypercium berries.